The Ashe County Christmas Tree Association is an association of family farmers in North Carolina's Blue Ridge Mountains that specialize in growing the Cadillac of Christmas Trees... the Majestic Fraser Fir. The Fraser Fir is highly prized all around the country because of its aroma, shape, dark green color, excellent needle retention and strong branches capable of carrying heavy ornaments. 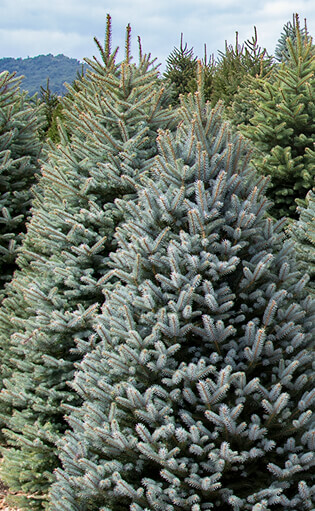 Learn more about the North Carolina Fraser Fir. Association members also grow a wide variety of other Christmas tree species, nursery stock, and B & B stock; along with making and shipping wreaths and garland. Other Association members operate Choose & Cut farms or retail Christmas tree lots that families from all over the South visit to get their yearly Christmas tree. For more information on the Ashe County Christmas Tree Association, please call the NC Cooperative Extension, Ashe Center at 336-846-5850 or email info@ashecountychristmastrees.com.